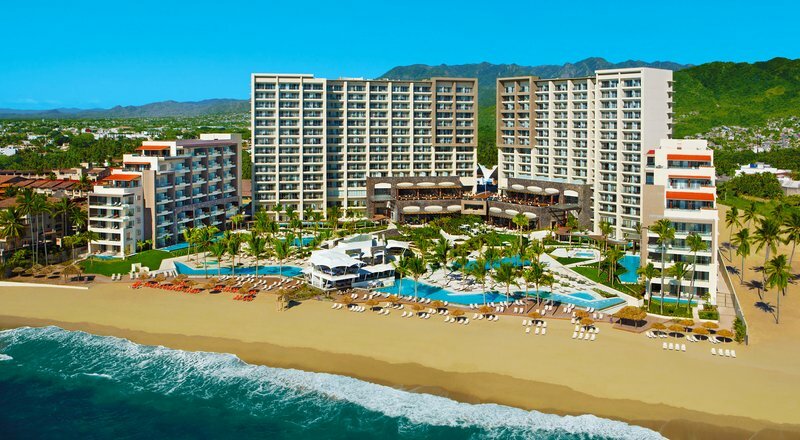 The Now Amber Puerto Vallarta is an unlimited luxury resort located on the Banderas Bay in Puerto Vallarta, Mexico. There is something for everyone at this all-inclusive resort designed for families. This resort is the winner of the 2014 Tourism Excellence Award from GrupoExcelencias, rated “Best Staff & Service – Mexico” by Apple Vacations in 2014, and is Rainforest Alliance Certified. Luxurious accommodations feature 327 suites stocked with various amenities. Junior suite options have ocean views or swim out garden views. Preferred Club Privileges are available for those who would likean even higher level of luxury. Perks include preferred status and amenities, concierge service, access to a private lounge, upgrade mini-bar service, pillow menu, upgrade luxury bath amenities, upgraded bathroom, complimentary newspaper in suite daily, books, DVDs, CDs, and more.Suites are equipped with a complimentary mini-bar and 24 hour room service. The resort has its own WiFi network with unlimited connectivity to guests. Gourmet dining options feature and international array of dishes. Guests can enjoy four a la carte specialty restaurants with no reservation required including Italian, Pan-Asian, Mediterranean, and Mexican. A buffet, barefoot grill, and a café are also available. Indulge at the world class spa with the latest treatments and massages. Facials, body wraps, massages, manicures, and various spa packages are among the services offered. Additional, a fully equipped fitness center is open daily for guests who wish to stay fit while on vacation. A variety of activities are provided to keep adults and kids entertained and happy. Three oversized pools, an outdoor whirlpool, kids club, golf course, family waterslide, water trampoline, and tennis courts are among the facilities available for use. Other activities such as horseback riding, fishing, dance lessons, Spanish lessons, yoga, archery, board games, soccer, volleyball, live nightly entertainment, and much more are offered for family friendly entertainment.